If heavy rain is forecasted, check this site on February 8 for possible cancellation. Lake Los Carneros Park in Goleta, CA will be the site of southern California's next international-style on-foot foxhunt. A ham radio license and knowledge of radio equipment are not required. Experts will be on hand to teach you the basic techniques of on-foot radio direction-finding (RDF). Bring the kids and grandkids, then go out on the course with them! There is no charge for participation. If you have receivers, scanners, directional antennas, attenuators, or other equipment suitable for on-foot RDF, be sure to bring it. Make sure all batteries are fresh. A limited amount of RDF gear will be available for loan to beginners. Besides some easy two-meter fox transmitters just to help you learn and test your equipment, there will be a beginner-level international-rules course on the two-meter band, designed by Marvin Johnston KE6HTS (at right). 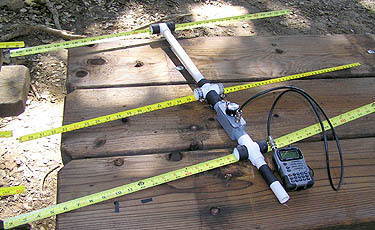 One or more optional 80-meter fox transmitters may also be on the air. The site area is slightly less than 140 acres. It is relatively flat, making it a good site for foxtailers of all skill levels. If you need some one-on-one help to get started at finding transmitters, just ask. Full-color orienteering maps will be available. For those who want to build RDF gear for use with their own two-meter hand-held radios or scanners, Marvin will have kits for measuring-tape yagis and active attenuators. Also available is an assembled and tested assembly that includes the power switch, BNC connector, housing and battery, ready to install as the tape measure beam is built. (See photo at left). There will be tools and soldering stations for building. If you're not an electronic technician, don't worry because there will be experts to help you. We want you to succeed! If you want to build an antenna/attenuator kit, you must register in advance. Send e-mail to Marvin (marvin@west.net) to pre-register and get more information about equipment. If you already have equipment and just want to hunt transmitters, you don't need to pre-register. If it takes place, the building session will start at 9:00 AM. Please be prompt. Transmitter hunting will begin about 10:00 AM. You may start out on the courses at any time until 12 noon. Courses close at 2 PM. For those interested, we will meet at a local restaurant after all the transmitters have been picked up for further discussion of ARDF. 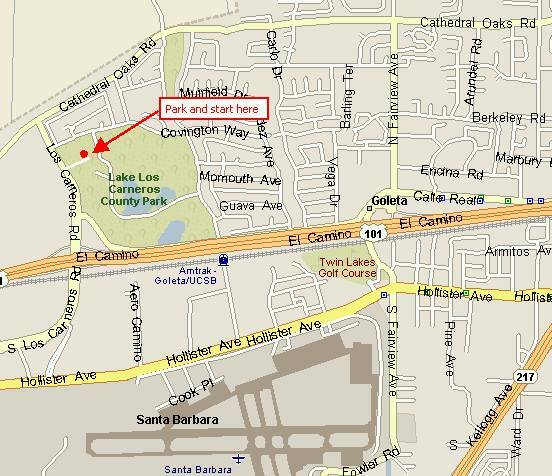 Directions to Lake Los Carneros: From US 101 about 8 miles west of downtown Santa Barbara, take the Los Carneros Road exit, head north about 1/4 mile and turn right into the Stow House parking lot. There should be plenty of free parking. Look for the orange-and-white orienteering flag (at left). The hunt start will probably be in the parking lot. If that is too crowded, we will move to a nearby picnic area. Ham radio talk-in is on the WB6OBB repeater, 147.000(+) PL 131.8.